The 1909 Buckingham Murders: Part XVI | slate river ramblings . . . .
On June 14, 1910, The Times-Dispatch reported that a change of venue had been granted for both Richard Perkins and Edward Jones. 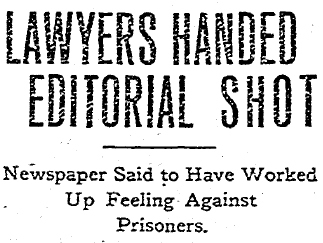 In these articles [in the James River Clarion] the jury system was severely criticized because of the influence exerted by the criminal lawyers, who are called “imported specialists.” Elsewhere there are references to “trickster lawyers” and “professional criminal clearers,” the intention evidently being to refer to the trials of the indicted men who were accused of the murder. [T]he order of the Supreme Court appears to lack that fine spirit of courtesy and comity which one court has the right to expect of another, and especially of a court possessing the power and prestige of a court of last resort. A sense of proper respect for himself, for the dignity of the office which he holds and for the high tribunal which issued the order, impels him most regretfully to say this much. Joanne, I just caught up on the last 4 posts in the Buckingham Murder series. I’m relaxing at home after some minor knee surgery and was a little behind in my reading. I really appreciate the amount of research and effort you have put into this series. It is a great story – I’m going to hate to see it come to a final conclusion.